Cooler temperatures signal that winter is on the way, reminding us to safely store all the accoutrements that make our decks, patios, porches and outdoor entertainment areas so enjoyable. The work you do now will make re-creating your outdoor living space a breeze come next season. Get your lawn furniture ready to store by wiping it down to remove dirt, dust and debris. If you see that it has mildew on it, then wash it with soap, water and a soft bristled brush. Allow the furniture to dry completely before moving it to storage. If you have metal tables and chairs, look for signs of rust while cleaning. You can remove rust with a wire brush before applying touch up paint. Once dry, add a coat of auto car wax for extra protection. This will make cleaning the furniture for a return engagement on the deck a snap. Plastic is susceptible to temperature changes. After sitting all summer in the blazing sun, letting plastic furniture languish in harsh winter weather may cause it to become brittle. Keep your plastic furniture looking nice by storing it indoors. 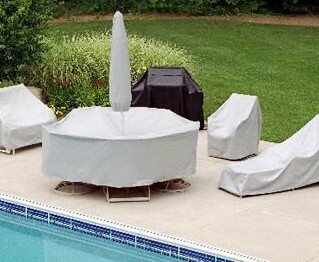 If you don’t have the space, secure a plastic cover or tarp over the furniture outside. Vacuum or brush off your cushions to eliminate storing them with any unwanted pests. Acrylic fabric is made to deter mildew but if it remains dirty it can harbor mold. If you notice black stains, wipe the cushion down with mild soap and water and allow it to dry before placing them in a plastic bag. Store them in a dry area. If you don’t use your grill during the winter months (some brave souls do! ), then you need to prepare it for storage. Fire it up – Burn off any residue on the grates. Scrape it off – Use a wire brush to remove stubborn bits of burnt food. Remove grease tray – If you don’t do this after each use then give it a good scrubbing now to avoid mold forming while in storage. Remove propane tank – Never store a tank indoors. Keep it outside and covered. Cover it securely – If you aren’t going to store it, then cover the grill. Investing in a sturdy cover with ties will extend the life of your grill. Garden ornaments and accessories are easy to overlook, but some of these fragile items may not survive a harsh winter storm. Wind chimes, decorative bird houses and glass globes should all be cleaned and stored indoors. Water features should be drained so they will not freeze. If you can move them, storing them will help keep the seals and gaskets safe from deteriorating. When you don’t need your garden hose anymore, untangle it, roll it up and store it. No sense buying a new one every year! And while you’re at it, tend to your potted plants. If you don’t have room for them to stay alive indoors, then contribute them to your compost pile. Turn all of your empty pots and containers upside down so they do not collect water. 8. Come spring – instant party! For some, closing up outdoor entertaining for the winter is a somber chore. However, you can feel accomplished – you just saved yourself a lot of work in the spring by taking care of it now. Once it is warm again, just dust everything off and you are ready to go. Instant party! You’ll be the host with the most. Meanwhile, all the good times are now moving inside where it’s warm. You might want to enjoy those this winter. From pressure washers to ladders, our expert staff is always on hand to help you with your yard and garden clean-up. For more helpful tips on how to get ready for the cold weather, check our blog, 3 Easy, Economical Ways to Winterize Your Home. As always, if you have any questions about what to choose, pricing or how-to’s, don’t hesitate to contact us. Stop by our store — we’re open seven days a week.